Property Size 350 sq. ft. 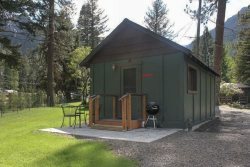 This is a newly remodeled 1 bedroom cabin close to the lake shore and the Wallowa Lake Resort office. The new attached bedroom has a king bed and a covered porch with a great view of the Wallowa Mountains. The Aneroid Lake cabin is right next to Glacier Lake (#3). This is a nice little cozy cabin to escape from reality in! It is within walking distance of many activities including restaurants, the Wallowa Lake Tram, miniature golf, bumper boats, the Wallowa Lake Lodge and more! It is a great cabin whether you are on the go and hiking and swimming in the lake or whether you just need a place to relax for the week and sit on the porch in the sun. Explore the Eagle Cap wilderness and reside in this vacation rental today! You won't want to miss out on staying in this incredibly beautiful place! New Covered Deck off bedroom with a nice view!